My husband and I will celebrate ten years of marriage this year, and one thing I know something about is how to build intimacy in marriage. To say these ten years have been simple and smooth sailing would be a lie! The truth is, we have had many bumps in the road and challenges but we have also had lots of joy, fun, and growth. There have been some key things I’ve learned over time that built and keep intimacy alive in our marriage. Be Interested in What Interests Your Spouse. It has never been a dream of mine to learn to golf, compete in Triathlons or watch hours of shows on the I.D. channel but these are things my husband enjoys. So, I have found ways to be involved in all these things. I have encouraged him to golf on Sunday afternoons, which is a time I can go with him and I drive the cart and take photos of nature while he plays. I’ve also learned the rules of golf and understand the terminology which makes it more enjoyable for me. It is really the same thing with Triathlons, I encourage him to train, I’ve learned about the sport, I know something about his favorite Pro Triathletes and I never miss a race. As for the I.D. Channel binge watching, let’s just say that I don’t complain when he does it and will sit next to him and read a magazine while he watches. Listen, Really Listen. Life is hectic and sometimes really listening gets overlooked. In our social media and technology driven world we often think we are connecting when we are really missing out on building quality relationships with the people who are actually in our life. It took me a while to figure out that housework, helping others, church groups, work issues or extended family drama often distracted me from actually stopping to listen to my husband speak. Not only do I put away my phone when he is talking to me, but I also make a point to look at him when he is talking. I have found that making eye contact helps me hear him better and retain what he says. Since I’ve started this, he actually has more to talk to me about than he did before. Really, I shouldn’t be surprised because who wants to talk to someone who clearly isn’t listening? 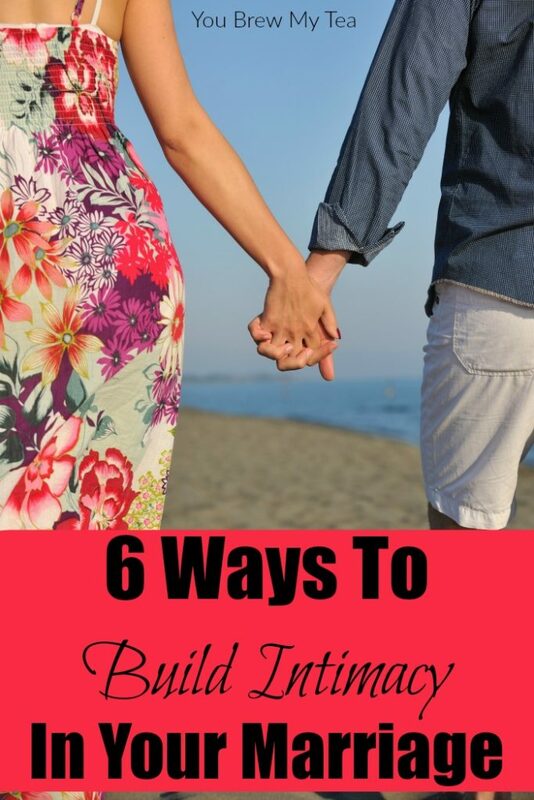 If you are wanting to truly learn how to build intimacy in marriage, this is one of the most effective things you can do for your relationship. Pay Attention. This is an area I have recently improved in and it came along with really listening to my husband. When I started listening and watching his actions I picked up on lots of little things I can do to make his life easier. For instance, we have a humidifier in our bedroom and we use it each night. It has to be refilled with water every 2-3 nights and I noticed that he would always fill it which was nice but when I really paid attention, he actually didn’t enjoy this chore. I’ve made it a point to be sure it is filled each evening so he doesn’t have to. In turn, he had watched me walk past the fresh cut flowers at the grocery store and comment on how colorful they were. A few days later, he came home from work with a bouquet of flowers I would never have bought for myself but certainly enjoyed every second of them. Little things go a long way to creating intimacy in marriage. Be Willing to Compromise. My husband is the most important person to me and I have to always be willing to compromise in order to preserve that relationship. We each came into this marriage with dreams, goals, and a plan. Even if it wasn’t all spoken out loud at the time, we had thoughts of what life together and the future would hold. Combining both of our thoughts and ideas of the future can create conflict and disappointment if we aren’t willing to see our spouse’s viewpoint and compromise. For almost five years, we lived in a city of over 6 million because it was my husband’s dream to live and work there. Some good things came for our time there but as those years came and went our marriage took some tough hits which were partly because of where we lived. After a lot of discussion with each other, we realized that we had to leave there and return to a smaller city with more peace and less chaos in order to preserve our marriage. This was a comprise for both of us. My husband felt like he had to compromise because a dream of his was ending. But I also felt like I had to compromise because after our move I would be working from home, which was difficult for a people person like me. In the end, we both knew it would benefit us far more to make these changes than to stay determined not to compromise. Take Notes. This may seem simple and unnecessary, but for me, it has done wonders for my ability to improve in the other five areas I have listed. Because all areas of life including work, family, church and my home can pull me in several directions, I have found that keeping a notebook regarding important information for my husband is very helpful. In this notebook, I keep ideas for gifts based on things he has mentioned, subjects to research, ways to pray for him and things I want to work on in myself and our marriage. This is also a place where I list goals we have or ideas we come up with. I’ve planned vacation details and have information about his work here as well. It has been a fun way for me to keep up with his favorites and is a quick resource when I am drawing a blank about something important we’ve talked about. I make and keep notes for other areas of my life so it makes sense to do the same for my marriage. 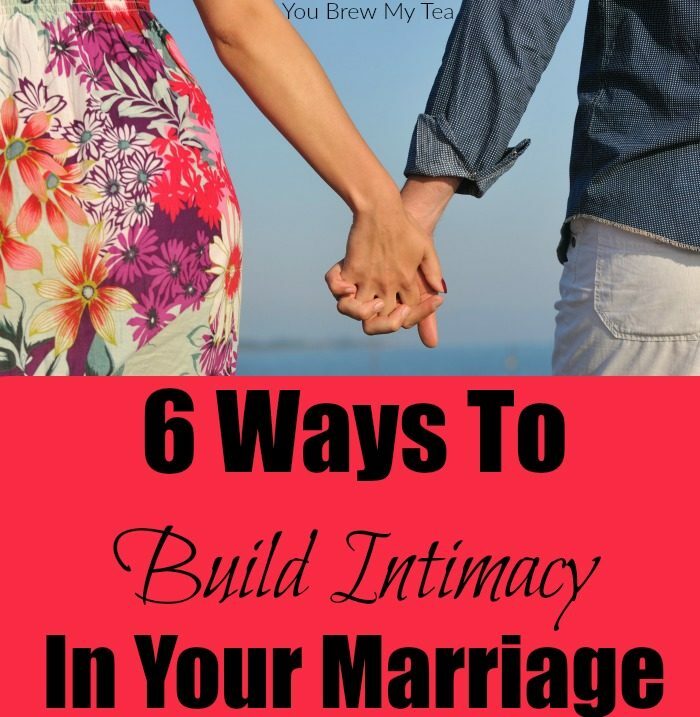 Building intimacy in marriage isn’t just about physical contact, but about emotional connection and thinking outside the box about ways to become consistent in your pursuit of knowing them better year after year. Take Care of Your Self. I’ve seen a lot of women neglect their own needs and wants in the name of taking care of their spouse. There has been more than one season in my life where I was guilty of this. What I have learned is that my husband takes notice when I am confident. It’s always easier to feel confident when you are taking care of yourself. This looks different for each person. Maybe, it means taking 20 minutes of quiet to clear your mind, taking a hot bath each evening, shaving your legs and putting on lipstick. For me, it means having quiet time each morning, praying, getting more sunshine, working out regularly and eating food that makes me feel well. By doing these things I have increased our intimacy in marriage in the long lasting important ways. While physical things are always important, knowing our relationship is strong is vital. Over time, I have discovered that my husband isn’t really different from me, because just like me, he wants a partner that is involved in his life, knowledgeable of his interests and one who encourage him to grow.